Being fifty-something, I don’t often engage in play and I’m wondering why that is. A few days ago I read this article. It’s long and rambly and takes a while to warm up but I found it worth the effort. It’s about giving yourself permission to play, really play in a pure, carefree, child-like way. How long is it since you’ve done that? The writer makes a clear distinction between play and exercise/sport. I hadn’t thought about that before. It really resonated with me. Aha! Nothing child-like, carefree or pure there. One of my most joyous times of the past few weeks was a spontaneous afternoon of kite flying with Mr P.
We headed down to the breezy common with a couple of dodgy, dusty kites we found in the shed. It didn’t matter that I was in skungy old trackie pants (with no makeup). It didn’t matter that the sky was overcast and the air blustery. Everything was perfect for kite flying. We ran. And we ran. We chased the wind. We planned strategy. Up on the rise? Down in the dip? Cross-wind? Downwind. We collaborated. We fell down. We picked each other up. We laughed and laughed and willed those kites sky-wards. There was no ego, no competition. We were just playing. Like a couple of kids. By the time we were done, we were wind-blown, grass-stained and suffering from string-burned fingers. We were also exhilarated. Kite flying was also a bridge back to the past when Dad used to craft kites in the shed, from plastic sheeting and quarter inch dowel and ordinary old string. 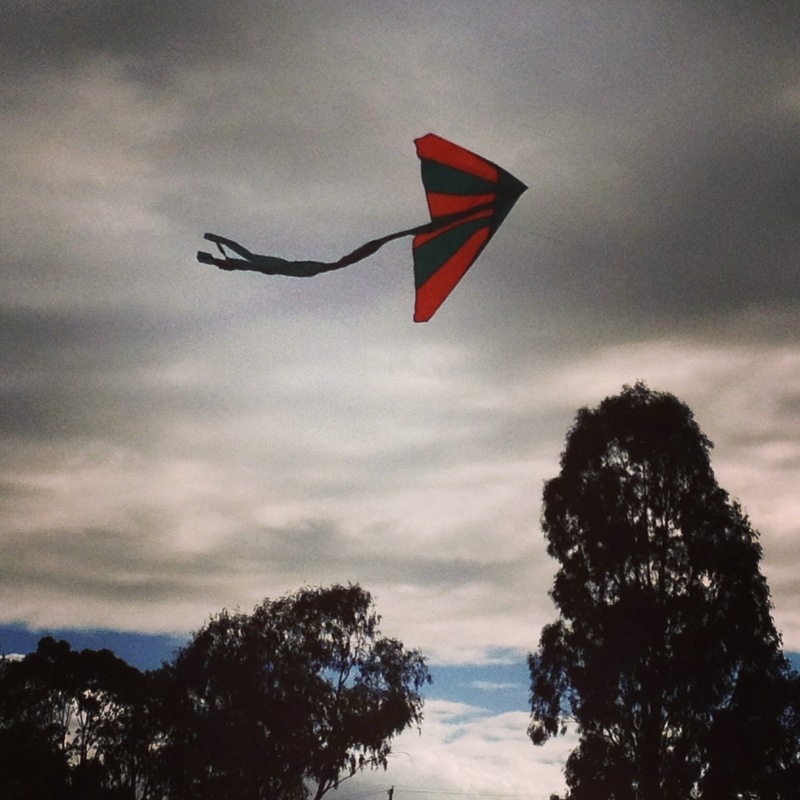 Our little house was smack-bang in suburbia but on a windy day you could usually spy a handful of kites on the sky-scape. Dad was allowed to test launch the kites from our back yard, midst the rotary clothesline and threatening powerlines. We (my sisters and I) had to wander around the corner to the local reserve where we’d launch our home-made beauties up into the big sky above the footy ground. In the article above, the author talks about integrating play into your every day. Have you ever considered meeting a friend (instead of at a café for a coffee) in the park for a game of catch or to throw a frisbee? It got me thinking. Mr P and I walk a lot. Sometimes we even ride our bikes. But we’re always headed somewhere, on a mission, even if it’s only to clock up a half hour briskly walked loop to meet our exercise commitment for the day. What if, instead, we bounced a ball to the park and then kicked it around when we got there? Maybe we could enjoy a swing or a see-saw while we’re there. Or a spur-of-the-moment game of chasey. What if we simply took turns kicking a can along the street? Even that would be fun. Because it’s pure and pointless. You don’t have to win or train or keep score. You just have to play. I hereby give my fifty-something self permission to play. I can relate. My sisters and I often remark that we don’t know how to have fun. We see responsibility in everything. Hubby, on the other hand, as the baby of his family, knows how to be carefree. We’re taking a getaway weekend soon and you’ve inspired me to find something we can do together that’s completely fun. Loved this. I run, a bit, more in the sense of play than the sporting sense as I’m slow and rather lazy. I really want to get out a frisbee now though! I’m finding meditation really helpful for anxiety too.